This 6 -days trek includes Toubkal ascent and walks past several Berber villages with a more detailed view on one village chosen according to personal preference. 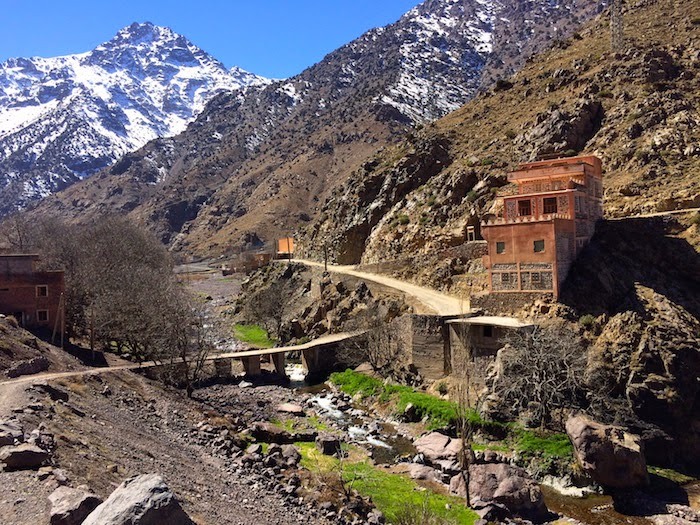 Besides wonderful views from the Toubkal mountain, the green Ourika valley (Setti Fadma village) with a river cutting it in half is another hidden gem of this walk. The trek continues up to Tacheddirt pass (3200 m) offering a view over the majority of the Atlas summits. The adjacent village of the same name lies in the heart of Imnane valley where most of the trekking routes start. It leads over the Tizi Mzik (2500 m) and Toubkal National park with the Tamsoult waterfalls. The hike up the highest North African peak is just a cherry on top and a nice ending to the whole trek. The next morning we continue up this valley to enjoying marvellous views of remote shepherd homesteads & arrive at the head of the valley to witness fantastic waterfalls (the Casdades d’Irhoulidene) beyond the last gite in the valley., where we enjoy a well earnt break. We return part way down the valley & steadily ascend up to another moutain pass, Tizi h’Mzik (2,489m), benefitting from fantastic views where we cross back over into the main Asni Valley, and descend down towards Imlil ( another Berber village) with views across to Jebel (Mount) Oukiemaden and its surrounding peaks. We reach the village of Around and enjoy a well eraned meal and night’s rest. 5 hours trek. After breakfast we leave Armed walking down to Imlil, then We trek over Tamatert pass to Imnane valley. From here there are incredible panoramas across the High Atlas at every turn. Slowly descend to Imnan valley. Overnight in local Gite at Tinerhourhine village. 5 hours trek. After breakfast we walk down following Imnane Valley, and passing through several Berber villages Ikkis, Amssakrou and Imsker. We trek over a small pass Tizi n’lbour to reach Imi Oughlad. After lunch we continue on by private vehicle to your hotel in Marrakech. A good nights rest. 6 hours trek. Note: From November till April this trek requires crampons and ice-axes.